I will be giving an 1.5 hour demo on lacquer painting techniques as part of the "Sci-Fi Vehicle Model Making Seminar". Spread the word and come by if you can. Register Now for the Advanced Sci-Fi Vehicle Model Making Seminar at Jerseyfest Academy ! 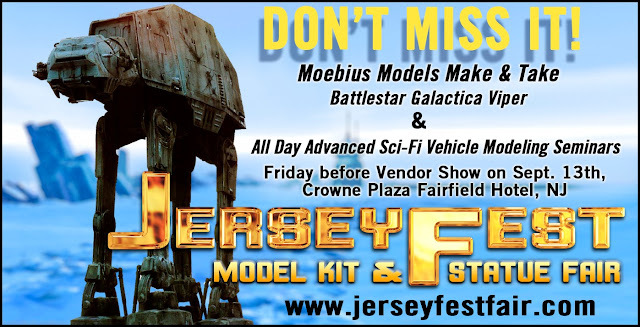 The 2013 Jerseyfest Academy features an all day seminar called “Advanced Sci-Fi Vehicle Model Making” from 9:00AM to 5:00PM on Friday, September 13th. The cost is only $60. The event is being held the day before the weekend long vendor show. Experts will demonstrate advanced techniques and methods for building, painting and customizing resin and plastic Sci-Fi vehicle and mecha model kits, such as spaceships from Star Wars, Star Trek, Battlestar Galactica, etc., and Maschinen Krieger/Ma.K (aka SF3D) kits. Techniques for resin model building, and making the most out of your kit stash (Michael Salzo). Implementing lighting kits in your models (Jason Eaton). Registrations begin now and seats are limited. Click here for instructions on how to register for this all day seminar.